If you’re an Apple device junkie or just someone looking for one of the newest and most intuitive ways to access video content, you’re going to love Apple TV. There is just one problem, though. Apple TV doesn’t allow their service to be used in many locations around the world. And Apple TV isn’t the only service that isn’t freely available to people who live outside of the United States. Countless other video and audio content sites such as Netflix, Pandora, and Hulu block users from select foreign countries. For that reason, people outside of the United States typically turn to a VPN service to give them a connection to a server based in the US in order to connect to their favorite streaming media. If you don’t already have a VPN service provider, we suggest you consult our best VPNs for AppleTV page. But why on Earth would a content provider want to restrict access based on geographic location? After all, wouldn’t they want their user base to be as large as possible?Well, there are a few reasons that they would not allow access to select global locations. First of all, the political climate across the Internet is always changing and there may be trade regulations that force content providers to bar access to certain locations. Additionally, there are various agreements and copyrights that prevent these types of companies from streaming their services to foreign nations. Also, Apple is not free of security exploits, and generally using a VPN across all your iOS devices including your iPhone, is the best security add-on to the rest of the benefits. As you might expect, one prerequisite to using Apple TV outside of a US-based location is a connection to a VPN server with a US IP address. Then you are going to need to select one of two methods that will allow you to access Apple TV content over a VPN tunnel. But for many people, the most challenging part is setting up their Apple TV with a VPN service. If you aren’t the most technically inclined type of person, take a deep breath and relax. It really isn’t as hard to setup as you might expect. The first method you can employ to send Apple TV traffic over a VPN tunnel is to use a flashed router with VPN capabilities. Your router doesn’t necessarily need to be flashed, but most (not all) of the standard OEM firmware that comes preloaded on wireless routers won’t offer the capabilities you will need. Operating system firmware such as Tomato or DD-WRT will give you the functionality you require, they are both free, and they will support the majority of router models on the market. Most of the top VPN providers on the market will offer a connection protocol type called OpenVPN. This will be able to terminate the VPN tunnel at your router – so every device on your network will be able to send traffic through the VPN tunnel. Just check out your VPN provider’s website to find information regarding the specific setup instructions for OpenVPN. Lastly, you are going to want to make sure that your Apple TV traffic passes through your router. It is extremely atypical, but some homes may have multiple or redundant Internet connections. If this is the case in your home, you will just need to make sure that the data gets properly routed through the wireless router that terminates your VPN connection. By terminating the VPN at your wireless router, you will be able to unblock Internet content for every device that resides on your home network. The second option at your disposal is the ability to use a technique called network sharing. The advantage to this option is that you don’t need a wireless router capable of terminating a VPN connection. The downside, of course, is that you won’t unlock content for every device that connects to your network by default. 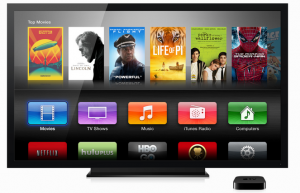 But at the very least, it will help you access your Apple TV content. To use this technique, you need to make sure that your Apple TV is connected via an Ethernet cable or via a wireless interface to a computer that has the VPN service running. Your Apple Device is basically going to “piggy-back” all of the data it sends over the computer’s Internet connection. Open up the Control Panel and click on the Network and Sharing Center. Then click on Network and Internet. You should see an option that is labeled Manage Wireless Networks. You will need to click on Wireless Connection and Network Properties. Take note that you can set this up on either wireless or Ethernet interfaces at your discretion. Next, click on Change Adapter Settings. Look for a tab at the top of this window that is labeled Sharing. Then, click on the checkbox that says Allow Other Network Users to Connect Through This Computer’s Connection. You should be all set to use this method on Windows. Just double check that your VPN service is connected to a US-based VPN server before using Apple TV. Visit the System Preferences menu and look for the option that is labeled Internet & Wireless. Then click on the Sharing. Find the Internet Sharing option on the left-hand side of the screen and click on the drop-down menu labeled Share your connection from. Then choose the Airport. Now click on the To computers using selection and choose Ethernet. Now you need to make sure that your Mac device is currently connected to a US-based server. Make sure that your Apple TV is connected to your computer with an Ethernet cable.